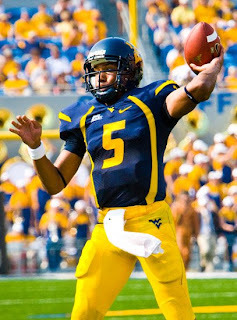 Pat White, the 4 year starting quarterback of the West Virginia Mountaineer's highly productive spread offense and a leading preseason Heisman candidate in 2008 broke another Mountaineer record on Saturday, this time not with his magic leg's, but with his arm. White threw 5 touchdown passes against Villanova, a top 'sub-division' football program that consistently challenged the Mountaineer offense by placing 8 and 9 guys in the box in an attempt to slow up the anticipated 'zone read' rushing show by White and Noel Devine. When new Mountaineer head coach Bill Stewart hired Jeff Mullen as the WVU offensive coordinator in early 2008, he did so knowing that Mullen was a 'take what they give you' type of offensive coach, something the Mountaineer's have been accused of ignoring the past few years under the past regime of Rich Rodriguez. Mullen stated after the the 48-21 West Virginia win Saturday, “I was pleased with his decision making. Fundamentally and athletically, the kid has been blessed before I ever got a hold of him”. “I was just real happy with where his eyes went to on every pass play in order for those completions to occur." “I’m a guru right?” Mullen joked. “There were a number of times today and during Patrick’s career when you go, ‘Wow, that wasn’t a very good call and then old #5 gets you out of that bind. He’s certainly a blessing to coach. White finished with career highs in completions (25) and attempts (33). Six incompletions were the result of drops or poor receiver play, an area Mullen and Stewart expect to improve on. Pat White, who has been compared at times to Vince Young looked more like Steve Young versus Villanova, standing tall in the pocket and firing accurate passes from his strong left arm. This latest development out of Morgantown must be sending shivers up the spines of defensive coordinators having to face White and the Mountaineer's this year. Just when you thought the 'game plan' executed so well by Pittsburgh and South Florida last year against the Mountaineer's powerful run game was a possible 'formula for success' (then again, White was hurt and not 100% in both of those games...), Patrick White shows us yesterday that his hard work in the off season and guidance from Jeff Mullen (previously at Wake Forest) has really improved his passing ability, giving the WVU offense the much needed balance it has needed the past three years. The Mountaineer's have a great challenge ahead of them this week as they head to East Carolina, themselves coming off a great win over a ranked Virginia Tech team.